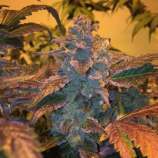 Here you can find a strain description about High School Sweetheart and also some user-based reviews and infos directly from the SeedFinder (if available). You can also find the offers and auctions here if High School Sweetheart cannabis seeds are on stock at MyCannapot right now. The High School Sweetheart brings us back to the days when life was more care-free. Every puff of the High School Sweetheart brings back more youthfulness and innocence. We brought together the illustrious Cherry Pie Kush and the Grateful Breath, two of the most unique flowers and flavors in our garden. A match made in heaven! The tight forming, potent flowers in both the Grateful Breath and Cherry Pie Kush produce surprising large and dense colas. The High School Sweetheart stays frosty and resin-packed. A perfect hash-plant. Expect beautiful color s as well. Take her to 10 weeks for extra hard flower formation. Flowering time averages between eight to nine weeks. High School Sweetheart is not available at our shop at the moment!